Even though the snow is starting to melt in Wisconsin, you can still find it on the slopes of ski resorts all around Lake Tahoe. All winter long you endured the harsh Wisconsin winters, but probably didn’t get to experience the joy of skiing. By now I’m sure all of you Freshman know, Wisconsin is very flat. Lake Tahoe is the perfect place for spring break, and skiing there is purely magical. Look out over the vast blue, unfrozen lake as you ski or snowboard down the practically empty slopes in just a jacket, maybe a T-shirt if you’re brave. By March or April, temperatures will get up to 55 degrees in the day, perfect for being on the mountain! No one likes skiing in the icy, freezing and blizzarding conditions in the Winter. In the spring, the snow softens and is very enjoyable. Also, most ticket prices are down and students are often eligible for discounts. While some of your friends may be on the beaches, spring skiing in Tahoe is the best spring break idea because it’s the last time you’ll probably see snow before summer (except for one of those crazy Wisconsin April snows). You can enjoy all the wonders of skiing, winter, and snow with prime temperatures. 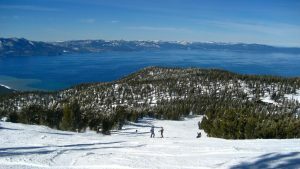 If you’re not a fan of skiing, Lake Tahoe offers lots of other attractions and activities. There are hikes all around the lake, with beautiful nature sceneries. Restaurants and other activities such as sledding are available.